With summer quickly approaching in Florida, severe weather is close behind. While these thunderstorms can be a beautiful and exhilarating sight, but they can also wreak havoc on your HVAC system. Protecting your comfort and safety should be a top priority, so learning what you can do to prevent damage to your HVAC system during severe weather is imperative. While high winds and torrential rainfall can certainly pose problems, the biggest threat to your air conditioner components is lightning. And with Tampa being the lightning capital of North America, we need to take a serious precautions. These bolts travel at nearly the speed of light and can strike your home from 10 or more miles away. They carry massive currents, too; the average is 30,000 amperes which is enough completely destroy any electronics in your home that are not protected. The heat alone, which is 54,000 degrees Fahrenheit (five times hotter than the sun’s surface!) can melt metal components and render them completely unsalvageable. There are several things that you can do to protect your home and HVAC system in the event of severe weather. First, when you purchase a weather radio, you’ll know well in advance where the severe weather will strike. Next, there are apps you can install on your phone so that you’ll get alerts wherever you go. You should always keep an emergency kit in your house and in your car, and you should stay in the house whenever you hear thunder. If severe weather is likely, go outside and make sure that things that could be blown into the outdoor part of the unit are put away. Last, make sure that you unplug any room air conditioners from the source before the storm actually hits. If a storm has stricken your area and damage of any kind is present, then you’ll need to be very careful when you assess the situation. Of course, if you’ve shut off the circuit breaker and unplugged the HVAC system, then chances are that it was protected even if lightning hit very close by. Remember, though, that the unit itself can be a lightning magnet, so stay away from it during storms or if power lines are down on or around your house. If the power is out in your home, be sure that you leave the unit unplugged until power is restored. This way, a sudden surge won’t cause irreparable damage to the circuits. Of course, the part of the system that is outdoors is the most susceptible, but the truth is that torrential rainfall will not interrupt the way the condenser works. What’s more likely is that high wind will blow debris around and cause it to bend, tear or even lodge inside the metal fins. 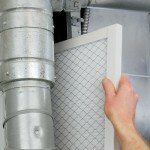 To prevent this, you could install a cage around your condenser, but remember that small debris will still slip through. You can use a special comb to remove the debris, though you should contact a professional if the damage is significant. 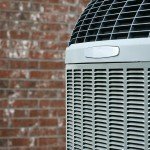 Severe weather can cause all kinds of problems, but it is possible to protect your HVAC system and your home in general by following the tips above. It’s always best to be prepared in any situation.